I’m going through a bit of climate shock. We mostly skipped over the beautiful fall weather I’m used to and went straight into cold and rainy weather. I’ve been wearing a winter coat, tights, scarf, and gloves for at least 3 weeks. It’s been another cold, rainy weekend. Opie and I have been hanging out next to the woodburning stove trying to finish up a website I’m due to launch this coming week. But all work and no play makes Sage an irritable girl, so I took a time out this afternoon to make a delicious pot of minestrone soup. Sauté the onions and garlic in a bit of olive oil, until the onions are soft. Add the carrots, celery, 1 t salt, oregano, black pepper, and basil. Stir, and cook covered over low heat for 10 minutes. Add the green pepper, zucchini, stock, tomatoes, chickpeas, remaining 1 t salt, and wine. Stir, cover, and simmer for 15 minutes. Bring the soup to a boil, add the pasta, and cook at a gentle boil until the pasta is done. Stir in a bit of spinach and cook until heated through. To give the soup a higher protein content, I substituted the cooking liquid from a batch of chickpeas for the veggie stock. The frozen spinach here comes bagged in little clumps which is pretty convenient; I used 4 clumps. I seem to remember little boxes of frozen spinach all clumped together in the US. If that’s your only option, you’re probably better off using fresh, or skipping the spinach altogether. That soup looks sooo good! I’ve written down the recipe and will definitely try it this winter. Thank you for sharing it. mmm wish I could jump through the computer screen and taste your soup! yum! 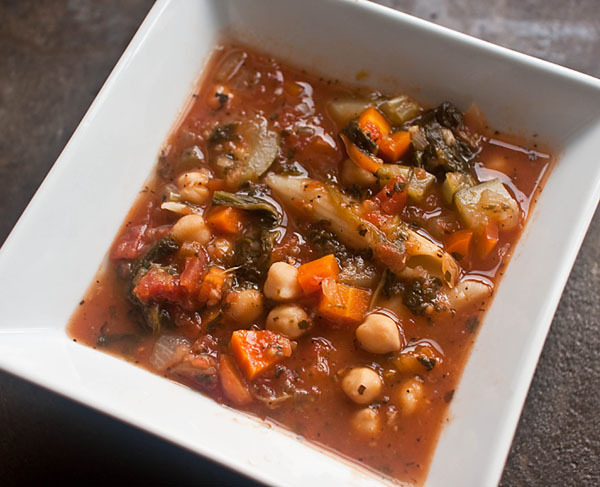 I love minestrone soup- I would love to try this recipe sometime :) Perfect for this time of the year!